As of this blog post for this week’s anime music selections, there are less than 4 hours left before I close things up and prepare for week 5’s stuff. The Spanish/Latin rhythm makes for a wonderful effect, especially when combined with the male choral part to yield a piece that’s filled with a certain grimness and works to bring out the seriousness of the overarching plot as well as the intensity of the action-y moments. While this track doesn’t get points this week, it does serve as an enjoyable change of pace amongst the tracks nominated this week as a result of this unique mixture. The opera part kinda fools you in the beginning into expecting some sort of brilliance like the Queen of the Night’s song in Mozart’s The Magic Flute, but that expectation is dashed once the rap part makes its entry. 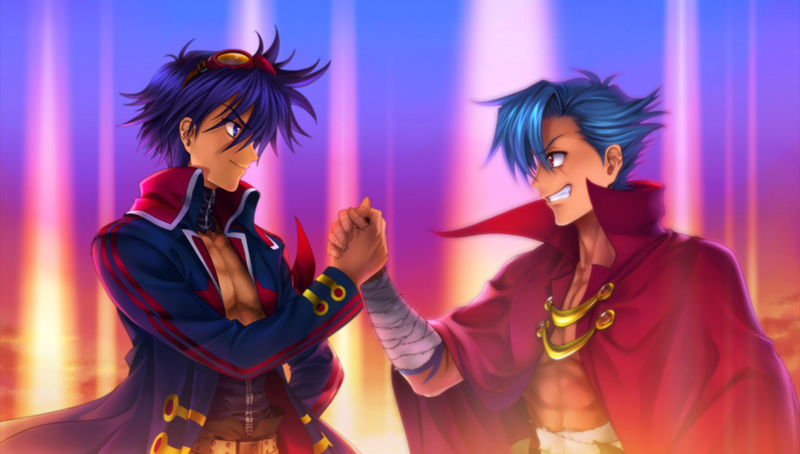 From what I’ve heard about TTGL (yes, I have not seen this series. BLASPHEMY!!! ), I can see how it meshes really well with the themes it espouses. As for the music though, I have difficulty enjoying the opera singer’s performance since the part starting around 1:23 feels cacophonous and directionless even though (oddly enough) I found the rap part to mesh well with the instrumentals. At least it does its job in bringing out the epic side of things and had I seen the series, I think I’d be able to appreciate this track a lot more. As it stands though, the track is decent even if I wouldn’t elevate it to “amazing” status. Yes, this one is different and I wouldn’t call this legendary as much as lost… or maybe that’s because the track gives me the feeling I might get if I were in an untamed jungle where danger might lurk around any corner. You can sort of hear this from the harmony, which has an affect of creating tension through its tempo and repetitive nature. It’s a nice change of pace though, but not point-worthy in light of some of the better selections. This particular piece actually sounds pretty good with all the awesome guitar work going in the background to provide an interesting backdrop to the vocals with all its grooviness while going through the verses. However, my rating on this piece plummets around 0:41 when the words “I think I can” are being sung in the chorus section. Those lyrics are just too cheesy for my tastes because it puts the image of The Little Engine That Could into my mind and I can’t divorce those intertwining thoughts from each other, turning a ROCKIN’ song into one that’s silly. If you wanted an example of a piece that could be ruined by just one section, “I think I can’s” chorus section would be a great example of that. Read or Die OVA – Bring all the wisdom to Great Britain! And yet… this piece also brings forth a bit of cheese, but it’s an enjoyable sort of cheese if you keep the backdrop of the series in mind since the concept of the British Library being in control of Britain’s super secret spy squad makes for an entertaining plot. The militaristic music is over-the-top, but I wouldn’t have it any other way and it makes for an enjoyable listen as you imagine the troops assembling to perform the task hinted at in the piece’s title through their objective of preventing powerful books from falling into the wrong hands. I really love this piece and it’s probably one of the first soundtracks that caught my attention way back in the infancy of my anime experience. It captures the essence of the movie really well, starting off with the grim opening that paints Ashitaka as a man on a mission to cure his disease and in doing so, setting the epic journey into its proper perspective. It’s subtle, but emotionally stirring and it will always stand out as one of Hisaishi’s better pieces. So there you have it! My point distribution can be found below. Week 5’s theme will be based on pop vocals, so if you want to get a head start, feel free to start digging into that week’s selections. A voting thread will be created once I compile all the music together, but I look forwards to giving them a listen! And I also hope to see some new faces turn up! It’s funny, “I Think I Can”‘s chorus is one my fav parts, but then the closest contact I have had with “The little engine that could” is a joke in Order Of The Stick. Experiences with certain cultural memes do affect my enjoyment of music, especially if it has lyrics that are easily understandable. So when you take the melody in that chorus section (which has a slight cheesy feel to it) and add in even cheesier lyrics, the result is not all too unexpected. And yes, I think I’m one of the few people out there who dislike it, so it’s just my tastes coming into play here.